There are all kinds of numbers in our life and not all are Natural. Some are Odd, some are used to getting Even. Some we do not want to divide like a cheese pizza between five, others we wish would subtract themselves on their own from around our girth. But some numbers feel more Prime than others. They feel special. Dates or times, calls or discounts – we all have a little number book in our heads, The Anthology of Celebratory Numbers. I do. A double-digit maths score from school (I passed?) or a three digit electricity bill (thanks AAP). High score in Mario Bros (always!) or shoes inside new shoe boxes (to the power zero). Certain numbers come to occupy a certain place in our minds, even hearts sometimes. They may be forgotten the next day or remain etched in permanent ink in that anthology I talk about. But numbers, like our ages, are always on an onward march in their own sweet ways. It’s March, and I talk of some such digits. 1 reminds me of those dreadful computer classes from school time. Binary was the name of a language (and you thought it was only that video game with an overgrown pac man eating balls?) and it worked with 1s and 0s. Dreadful, but I repeat myself. Those combinations of 1s and 0s made knots in my mind and earned me crosses in my report card. Only, March ’14 brought to my blog a combination I had never seen for myself, not even in the bank, I swear. 100,000 page views. Such a long number, like two trains put together with an engine combined. I still start counting backwards when I see big numbers to make myself sure (remember at the start, my Maths was bad?) – unit, tens, hundreds, thousand, ten thousand, lakh lakh vadaiyaan. My blog was viewed so many number of times. A round figure number and a fleeting favourite I froze before I refreshed the page. Before it turned to just another number in the series, albeit higher. See it in the picture? This March brings me some really special numbers. Like a water-colour painting of a sunny sky. Tinged in different shades of bright and happy yellow, and a little blue too. Do you too have some memorable ones circled in red ink, scribbled in that book I call The Anthology of Celebratory Numbers? Hiding in your head or maybe tucked deep inside your heart? You know some of mine, the numbers this March. Contributing to your Anthology - A 100 on my Happily Ever After came up just yesterday. Such a nice post.. simple yet awesome.. congratulations. . Keep writing..
Congrats , Stay happy ! its easy ! What a cool post. I simply loved the flow, just took me with it. Very few posts do that. The next zero is goin to take much less time than this one.. I can assure you that! Big bouquet of regards to Rekhi mam..22 yrs indeed is a long time .. and she would certainly be more than happy to see her best student (read daughter :)) doing so well! Zuber, muh mein ghee shakkar. Rekhi ma'am remembers you, every 5th of Dec. :D Maybe you should meet her when you are in Doon next. Your(our) batch was her first batch taught. All firsts are special! Congratulations ! And here's to many more ! March for me is never a good month - First it meant exams and now the Financial year end. I am glad the month brings such happy times to you ! Well, plan a few meets with happy people. The month may look up for you then. Come on, the weather is changing, the woollies can finally be boxed up, spring is springing in. Did you see the tiny flowers on the divider when you drove to office? You, my dear, are always in touch with Nature. It's a gift. I am sure March will be a good month for you! Congrats :) That was a breezy post! Wow!!! Celebration time for sure...!! Yes, Rajesh. Thanks for stopping by! Congratulations to you and your Mom ...this month is full of joy and celebrations.. after all its 'springtime'!! Spring is the word, Bushra. Thanks a lot! Interesting to read your tryst with numbers. Your mom retires! That will be bittersweet for her. For me the number 11 and 2 hold special significance. Hearty congrats on becoming the lakhpati :-D. May your blog make you crorepati soon. Always a delight to read your posts, Sakshi. People say that numbers are boring but the way you have used them they are both interesting and adorable. The number 4 is vital in my dads life, I am actually sitting now with a pencil and paper trying to find mine. Here's wishing your mother the very best for future. The storm, the conflict running inside her is understandable. My mother had gone through a similar phase. She has been a teacher for life. She retired as a principal about two years ago but hasn't stopped being a teacher :). She has found different avenues to stay in touch with her passion, at the same time she uses her time enjoying other things life has to offer her. And now she is in a comfortable space in life. So I'm sure your mother will be fine too as she steps into the next phase. And congratulations on the massive number count on the hits to your blog. 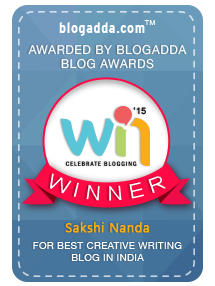 Keep blogging, keep writing..
Deeps, thank you. The post arose from her impending retirement, and I realised how my 100k stole the show. I will be directing my mother to read your heartfelt comment, a slice from your mother's life. I am sure she will settle into her "new" life with as much passion as ease. The way you narrate :) can get one to fall in love with numbers ( however bad they were at maths) Congrats to aunty...it's a long period and if is difficult to call it quts...I know cz my mum too has been teaching for the last 25 years! Hv a grand celebration and hv an extra slice of cake from my side :) n congrats on hitting the no. Soon it'll hit a million mark! Thanks, Aditi. For all the good wishes and for the 'way you narrate' with a :).